Shanley Knox, left, and Florence Okunim, a Ugandan artisan. Most Americans don't go to Africa looking to start a career. But that's exactly what twenty-five year old Shanley Knox is doing. Raised an evangelical Christian in Northern California, Knox spent several summers in college writing for a faith-based aid organization in Uganda. But she soon became disillusioned with religious-based charity work. "There was a discrepancy between what the locals wanted and what was being given to them," she said. So she decided to start her own business selling Ugandan-made products to consumers in the West. She started with paper beads. Now she's getting much more ambitious. With Ugandan-born business partner Olivia Byanyima, she formed Olivia Knox, which aims to make and market jewelry, eyeglass frames, dishes and other products made from the horns of a revered Ugandan cow. "I felt like partnering with locals was the most effective way to help people," said Knox. "And I can start a career for myself." The company is brand new -- it just incorporated in February -- and started with just $7,000, mostly from family members and an Indiegogo campaign. Currently, the company contracts with a local Ugandan factory and a government-run incubator where artisans make similar goods. Sales are modest so far. The firm has three jewelry accounts -- in Canada, Ireland and the United States -- that brought in maybe $1,000 last month. But the plan is to go after luxury fashion and eye wear businesses, where exotic cow horn frames can cost up to $15,000 a pair. They are currently exploring partnerships with French and Chinese firms. Knox, who's based in New York City, spends much of her time courting fashion designers. She says at least a half a dozen are interested in the products. Once they have more buyers, they plan to open their own factory in Uganda, possibly with the same artisans and workers who currently make the goods. The aim is for conditions in the factory to be much better than those in many other local facilities. This is part of a big emphasis on social responsibility. Knox said they plan to hire 10 local women who will be paid a living wage -- which she said is about $200 a month, or twice as much as many garment workers make. They are also working to join a United Nations program focused on empowering women. Much of this social responsibility focuses on the cows, known as Ankole, which are slaughtered for their meat in Uganda while the horns are underutilized. For centuries, the cows, which are native to Africa, played a pivotal role in the nomadic Bahima Tribe, which Byanyima was born into. The people lived off their meat and dairy, and the animal became ingrained in the tribe's music and folklore. It's still exchanged at weddings (the price for Byanyima's hand in marriage: 14 cows), and is a measurement of wealth. Wearing the cow's horn is thought to be an aphrodisiac and bestow other special powers. 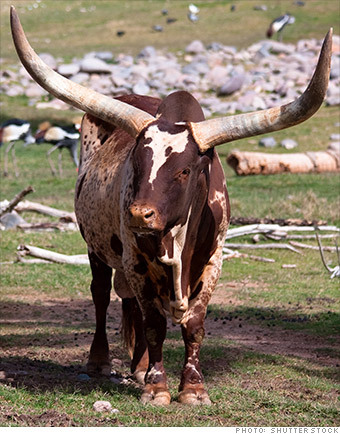 Despite this -- and its large, colorful horns -- the breed is in danger. Other cows produce more milk, so local farmers are cross breeding the Ankole with breeds like the Holstein, which eventually eliminates their horns. "If these cows become extinct, my culture will go with them," said Byanyima, 34, who has an MBA from Columbia University and runs the finance side of the business. The hope is that by increasing the value of these horns, farmers will have an economic incentive to keep the breed pure. Byanyima, who's been in the United States since 2003 and previously worked in finance, met Knox at a fundraising party last fall. She's quick to note the contrasting career paths of the two of them. "I came to the United States to figure out a life for myself, and she's doing the reverse," said Byanyima. "You don't think to look for opportunity in Africa, but it's there."